March is a lamb with sharp teeth. It is snowing on the 23rd, with 3-6 inches predicted for my area. Many of my friends and colleagues are teetering on the edge of stability after this endless winter, and today’s storm may push them over the edge. I wonder: Is it safe to go to the office today?! Luckily for me, I have the words of Thalassa Cruso to remind me that everyone knows that March is cruel. So instead of wallowing, I will share photos I took of my garden a few days ago. 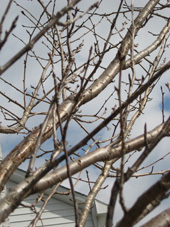 Mother Nature is clearly planning to have spring arrive at some point. I intend to be rational and calm when it does arrive, the better to appreciate! Purple, striped, and white blossoms at the base of my lavender plants. 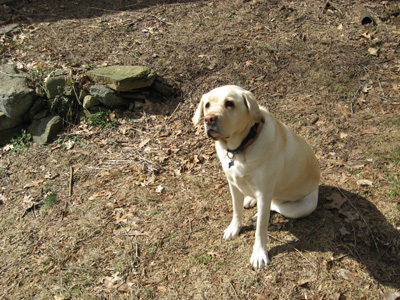 MacKenzie has enjoyed my early-spring walks around the garden. I ask her if she wants to go Crocus Hunting, and she always says yes. It's hardly sporting: looking for brightly striped green leaves and purple blossoms in the midst of a sea of brown lawn. 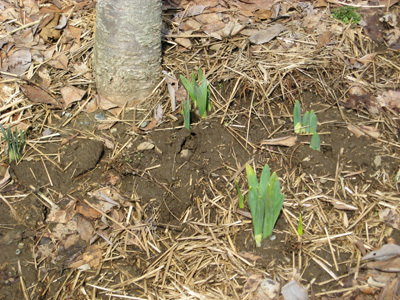 Daffodils emerging at the base of the cherry tree. 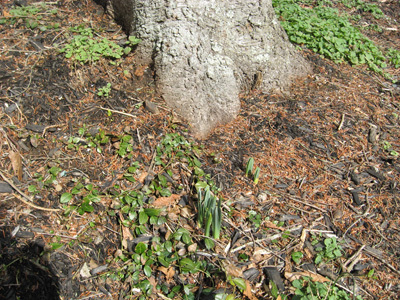 Daffodils at the base of the pine tree, and rising above the vinca. 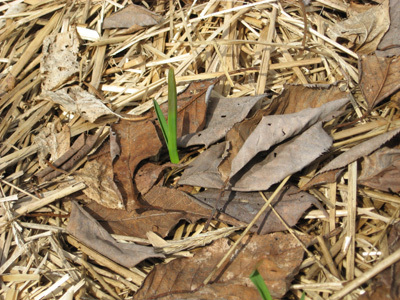 Garlic, one of the earliest and bravest to emerge. 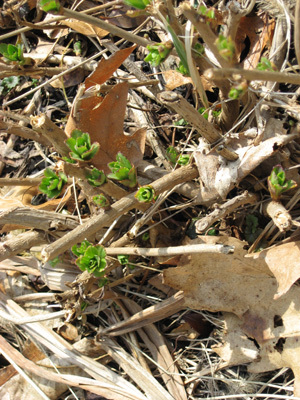 Montauk daisies, green buds along a brown stem. After bending down to search for crocuses, it was a relief to look up! I was so thrilled to FINALLY be almost rid of the snow, and I awoke to 8″ of the white stuff and it’s STILL coming down hard. I hate March so much. And this , from a snow lover. It’s just that by now, I’m antsy to get out in the yard, and the constant back and forth between snow and warmth really frazzles my nerves. Hopefully April will bring warmth and sunshine. 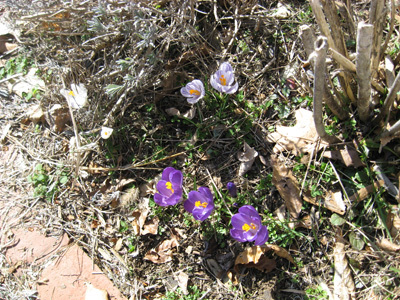 I loved seeing your photos of crocus. Just lovely after all the brown! I learned the hard way — the only way to survive in New York State is to chant every March and April: It’s not spring ’til May. It’s not spring ’till May. That way I’m not planting outside too early or expecting spring weather as soon as the calendar says spring has arrived. I hope April brings NO SNOW. Then SUN. And then…..maybe…warmth! I think we all deserve it after this punishing winter! So glad that you got the pictures before Mother Nature covered the crocuses with snow again. Hopefully they’ll be out again, soon! We only got about an inch here and it didn’t do anything on Wednesday, it was all over night into Thursday. The girls were upset it didn’t impact school but I was grateful it didn’t mess up my interview. I think it went well. Fingers crossed. Talk to you soon. Thank you for your comment, Pammi! Yes, Justine walked past the crocuses this morning after a 2-hour school delay, and keeping fingers crossed for YOU (not that you need it!). I am ready and eager to mix up my potting soil mix and make soil blocks — to start seeds indoors, but it is too cold right now to work outdoors! I may have to bring the wheelbarrow into the basement, tote the compost into the basement and work from there. Gee whiz….